After humidity, temperature and light are next most important requirements of orchids. Preferring high humidity, temperature and light requirements of orchids can vary according to the region of origin. Though, it is always better to grow orchids that are best suited to the local climate. But sometimes, by providing the right environment orchids from other climatic conditions can also be grown successful. In case of cold weather orchids, i.e orchids growing in cold temperate forests, there are a few things to be kept in mind for successfully growing these in warmer temperatures. 1. Humidity: Keeping humidity high and accompanied with good air circulation will solve a lot of problem. But beware of pests and diseases, as high humidity is like an open invitation. Another thing to note of is that extremely high humidity (90% and above) when coupled with low temperatures can be harmful. Do not over water, as temperate orchids also face dry periods like their tropical cousins. Let the orchids dry out before watering the orchids again. 2. Temperature: For all orchids temperature fluctuation between day and night is important for proper growth and for flowering to occur. In case of tropical orchids, the difference in the day and night temperatures is not much. However, the temperate orchids can see a significant drop in the night temperatures. For these orchids night temperatures are critical, whatever day temperatures might be. Try keeping the night temperatures around 20 °C during summers and around 10 °C. Sometimes, high nighttime temperatures can promote vegetative growth in orchids instead of flowering even when adequate sunlight is provided. In such cases, orchid flowering can be induced by lower the nighttime temperatures. 3. 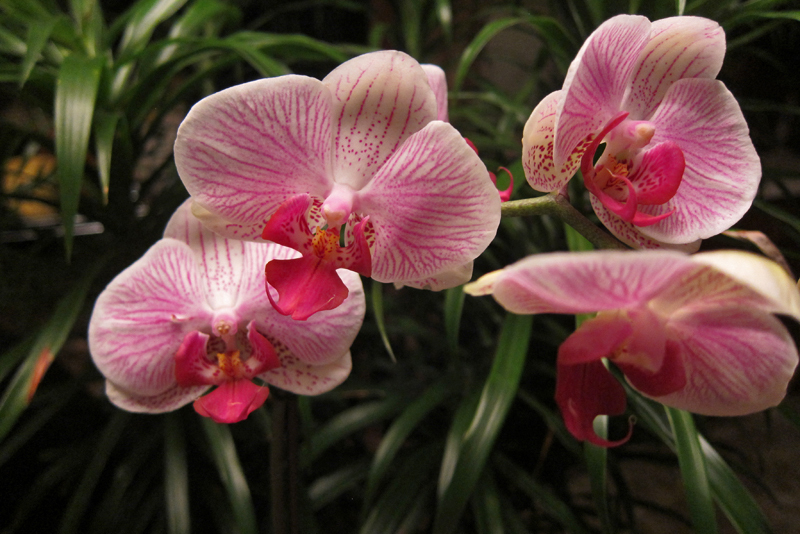 Light: Cold growing orchids can tolerate direct sunlight when the day temperatures are not high. But will show symptoms of sunburn even with high humidity, if they are kept under direct sunlight with high daytime temperatures. One of my cold weather orchids is struggling hard to survive after a session in direct sun (because I forgot to shift to a shaded area). It is best to provide a partial sunlight or keep the orchid in the soft rays of the morning sun if you want it to have some direct sunlight. 4. Fertilization: These orchids can be fertilized according to their specific requirement or you can follow the ‘weekly weakly ‘ regimen. Orchids growing in cool temperate forest can be found in a number of genera like Anguloa, Bletilla, Cymbidiums, Disa, Dracula, Dendrobium, Epidendrum, Laelia, Lycastes, Masdevallia, Miltonia, Odontoglossum, Pleurothalis, Sophronitis etc.